Pondless waterfalls have all the good parts of a water garden, but none of the green water or fish worries of a pond. 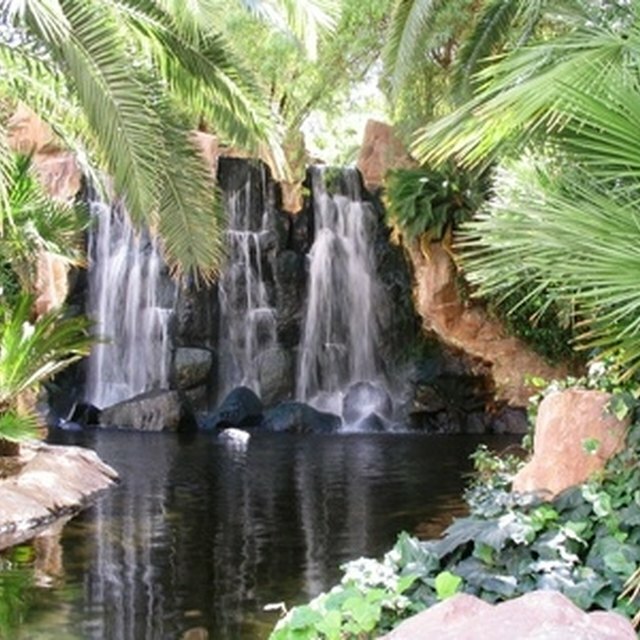 For those people who want water sounds in their garden, a pondless waterfall may be a great way to have it. They are relatively easy to build if you wish to do it yourself. Dig a hole just slightly bigger than the tub and about 4" shallower than the tub is deep and place the tub in the hole. Fill the tub with water using a garden hose. Arrange the sand with the bags open around the tub. Stand in the water to keep the tub from floating up while you level it. Have the garden hose where you can reach it with the water turned on at the hose bib, but turned off at your end. Start pouring the sand in the space around the tub to fill up the spaces between the edges of the hole and the sides of the tub. Use the water from the hose to assure that there are no empty spaces. Put the pump in the water. Put a large flower pot over the pump with the clamped tubing sticking out. Put a flat rock on the flower pot. You will place no more rocks on top of the flower pot. While still standing in the water, begin to place large round rocks in the water. Do not cover up the tubing. When you are finished can no longer stand in the water, get out and finish filling up the tub. Place the flat rocks around the tub to cover the 4" you left sticking out. Cantilever the top rock over the edge to further camouflage the rubber tub. Place 3 or 4 rocks where you wish to have your waterfall. Grab the tubing that is sticking out and place it on your new waterfall. Plug in the pump. Be sure the water that is running over the waterfall is all going back into the tub and not splashing out of the water. Continue rearranging the rocks until you are satisfied with your waterfall. Add chlorine to keep the water free of algae. You can put some plants around your pondless waterfall. They do not have to be pond plants, only plants that will thrive in your climate. * At least 3 bags of child's play sand. • Use the sand to get the tub level. • Stand in the tub to keep it from floating up.